Conservative writer/filmmaker Dinesh D’Souza was spared prison time today when a federal judge sentenced him to five years probation for violating campaign finance laws. For the first eight months of his probation term, D’Souza will have to live in a "community confinement center" in San Diego, ordered Judge Richard Berman, who also fined D’Souza $30,000 and directed him to undergo “therapeutic counseling.” D’Souza will also have to perform one day per week of community service during his probation term. In remarks before announcing D’Souza’s sentence, Berman said that he did not believe the defendant had accepted responsibility for his crime. “I’m not sure, Mr. D’Souza, that you get it,” said Berman, who referred to D’Souza’s claim that he was a victim of selective prosecution. D’Souza, who was married to the defendant for 20 years, wrote, “In one instance, it was my husband who physically abused me in April 2012 when he, using his purple belt karate skills, kicked me in the head and shoulder, knocking me to the ground and creating injuries that pain me to this day.” Click here to download a PDF of Dixie D’Souza’s five-page letter to Berman. 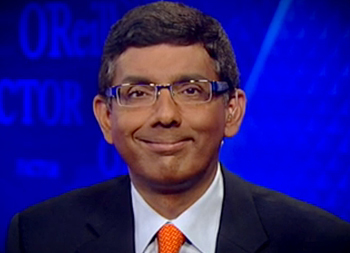 Dinesh D’Souza filed for divorce in October 2012, and that case remains active in California’s Superior Court. In May, on the eve of his criminal trial, D’Souza pleaded guilty to illegally arranging $20,000 in straw donations to the 2012 U.S. Senate campaign of Wendy Long, a New York Republican who was challenging incumbent Democrat Kirsten Gillibrand. The 53-year-old D’Souza, a close friend of Long, personally reimbursed the straw donors, effectively allowing him to exceed the $5000 limit for individual donors. According to a probation report cited by Berman, D'Souza's net worth is in excess of $5 million. D’Souza, pictured above, was sentenced by Berman during a two-hour hearing in U.S. District Court in lower Manhattan. The 71-year-old jurist was appointed to the federal bench by President Bill Clinton. In a court filing, D’Souza’s lawyer, Benjamin Brafman, asked Berman to sentence his client, a first-time offender, to a probation term that would include a community service component. Brafman contended that D’Souza was singled out for prosecution by the Department of Justice due to his “consistently caustic and highly publicized criticism” of President Barack Obama. In response to D’Souza’s plea for leniency, federal prosecutors asked Berman to sentence to the convicted felon to 10 to 16 months in prison. “The defendant’s crime is serious and strikes at the heart of our federal election system,” prosecutors argued.